Choose from the available dates below to start your reservation. We recommend requesting dates at least one week out for reservations to ensure availability. If booking with less lead time than that, be aware that we may not be able to accommodate your request. If you have questions, please contact us. The general reservation calendar specifically covers guides within Southeastern Arizona (Tucson area and south and east from there). For the greater Phoenix/Maricopa area please see Gordon Karre’s calendar directly. For Prescott, Sedona, Verde Valley, Northern and Central Arizona, see Felipe Guerrero’s calendar directly. Click once to select dates, click again to de-select. How it works You can book guide services with this guide by selecting from available dates above, or you can book through the general calendar. All you have to do is submit the form with your contact information and any special requests, and your guide will make contact with you directly, usually within 24 hours, to arrange your time afield. There is no additional charge for using AZ-Birding; you’ll pay your guide directly at her or his usual rate. Learn more about our guides and what to expect. 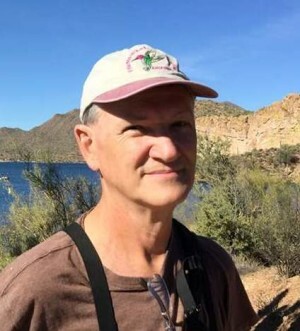 PHOENIX/MARICOPA COUNTY ONLY: Gordon Karre is an avid birder from Mesa, AZ, and is very familiar with the many specialty birds to be found in and around the Phoenix area and Maricopa County. Growing up in rural southwestern Nebraska, he has always had a keen interest in our fine avian friends. This area of Nebraska is a key cross-over where many species cohabitate. Childhood memories include nesting Indigo Buntings and a visit by a Scissor-tailed Flycatcher. Since relocating to Arizona 12 years ago the birding interest has grown. He has led several field trips for Maricopa Audubon and has participated in many Christmas Bird Counts, Global Big Days, the annual Greater Phoenix Waterbird Count, and also assisted with the latest Rosy-faced Lovebird Census in the Phoenix metro area. He is now retired and still enjoying the birds and thoroughly enjoys sharing his knowledge of the many species that can be found in Maricopa County and the Phoenix area. Contact WINGS Questions about your reservation, birding in Arizona, choosing a guide? You can call the WINGS office at (866) 547-9868 (toll free from the US and Canada) or (520) 320-9868, or e-mail us at wings@wingsbirds.com.